Provide comfort for the family of Robbie Kernohan with a meaningful gesture of sympathy. Passed away peacefully at home on Wednesday April 10, 2019, at the age of 57. Brother of Tony (Marie) and Randy. Will be lovingly remembered by his nieces Randi, Marcia and Marie. Resting at the Armstrong Funeral Home, 124 King Street East, Oshawa on Tuesday April 16th from 6-8 pm. Memorial donations to the charity of your choice would be appreciated. To place an online condolence or donation please visit www.armstrongfh.ca. To send flowers in memory of Robbie Scott Kernohan, please visit our Heartfelt Sympathies Store. 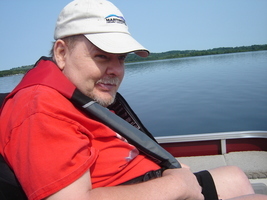 Provide comfort for the family of Robbie Scott Kernohan by sending flowers.